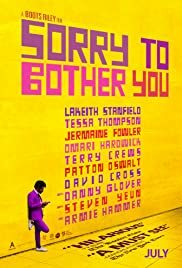 Sorry To Bother You Review – Reviews Downloads and More! Watched this thinking it is simply just a comedy. It is a lot different from that by far. This is about a guy getting a telemarketing job and choosing to move up in his position instead of going on strike with this friends for better pay. He quickly learns he made a huge mistake when he finds out a very twisted messed up secret the company is doing to employees. I find this movie to be ridiculously silly and crazy. Almost to the point to where it is cartoonish. That being said, it isn’t a “terrible” movie it is just strange and isn’t what you expect it to be at all.